Whilst November 23rd 2013 maybe all about Manny Pacquiao's return to action in Macau, it's worth noting that Pacquiao isn't the only major fighter in action this coming weekend. In fact two Russian's are in world title fights on the same. One of those, Evgeny Gradovich, is of course on the same card as Pacquiao in Macau. The other, Alexander Alexseev, however isn't. 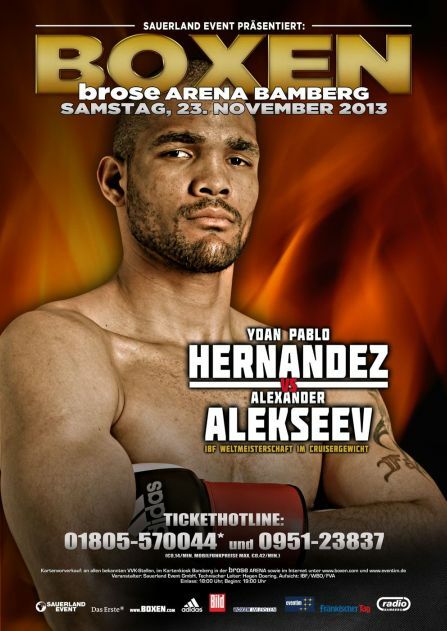 In fact Alexseev travels to Germany in an attempt to dethrone Yoan Pablo Hernandez of the IBF Cruiserweight title. Unfortunately if you were to see the poster from Sauerland Event you'd certainly see that Alexseev is being given little chance against Hernandez who takes up most of the poster. Yeah sure Alexeev's name is on the poster but it's a weak poster all the same and one that will be making us support Alexeev more than we would have anyway!